Looking to authentically connect your brand with the social media community? Wish you could get the right people to get the word out for your business? Hay There Social Media can help! We all know that word-of-mouth referrals are the No. 1 way to get someone to try your product or service. Better yet, a word-of-mouth referral from someone you know, trust and respect – otherwise known as an influencer – is the most powerful of all. In today’s digital era, social media is the best way to spread word-of-mouth recommendations. Brands recognize the advantages of having online influencers talk about their products on Twitter, Facebook, on photo sharing sites, in YouTube videos, blogs and more. What could instant viral discussion do for YOUR BRAND? What if you could flip a switch and get REAL people in YOUR target market Tweeting about your products to THEIR social networks? Launching a new product or opening a new location? You now have the option to put people on-site to stir up viral, real-time social media discussion about your business! Are you creating effective social campaigns but could use some help reaching and activating a number of high-quality local influencers quickly and efficiently? 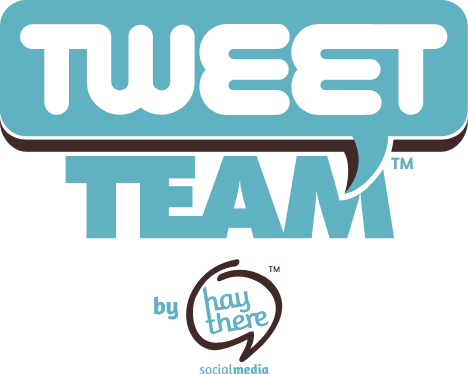 A TweetTeam™ — like a street team – is an authentic, innovative concept by Hay There Social Media that puts REAL SOCIAL MEDIA USERS at your event and in your virtual audience. They Tweet as themselves to their social networks about YOUR business. Want to get the word out to the social media community? Get your product discussed by a TweetTeam™; the people who inspire others to act! We save you time and money by finding key members of your target market who are influential in their social media communities. Our winning TweetTeam™ members are individually reviewed and selected based on your needs. We implement and manage your project and provide measurable results that leave a lasting impact. Learn about our recent TweetTeam™ projects under case studies on our website. Image from our latest TweetTeam™ project! Pssst…are you an active social media user? Do you have your own blog, use Facebook often and love to tweet? If so, Hay There Social Media wants to hear from you! Contact us today as we prepare our exciting TweetTeam ™ initiative to find out how YOU can become a member of a team!